Hate is a harsh word to use. DC had an apparent solid 5-1 lead early this night. But The Florida Marlins surely give The African Queen and I the ability to dislike them ever so greatly. 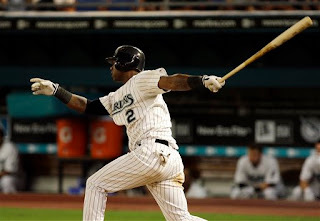 Does any one team or one player, outside of Ryan Howard of The Philadelphia Phillies, crush Our Washington Nationals more than The Florida Marlins and Hanley Ramirez? No lead is EVER SAFE against The Fish. Ramirez is such fine hitter, he golfed a Craig Stammen pitch so low and on the outside corner of home plate in the bottom of the 6th for a two run homer--you just had to give Hanley credit for his talent. The same skill Ramirez used to sock another outside pitch from Joe Beimel for the game winning two run single tonight before The SKIES unloaded with rain in the 7th frame tonight at Land Shark Stadium. What is it with The Marlins? The New York Mets have always dominated Our Washington Nationals. Yet, of late, The Florida Marlins OWN US!! The 8th straight victory over DC's Team in as many games scheduled in 2009. Craig Stammen was beaten by a professional hitter known as Hanley Ramirez during the 6th frame tonight at Land Shark Stadium. He was also hurt by three key errors by Ryan Zimmerman and another by Josh Willingham with the bases loaded in the key final frame with Joe Beimel on the mound in the bottom of the 7th. Washington most always needs to play perfect baseball to win. And this evening--this rain shorted game epitomized Our Nats shortcomings. Not only is no lead ever safe, but our young pitching is inexperienced and needs to learn from their mistakes. Stammen was good, but just not good enough. Our Number 35 needs to take a lesson from tonight. Craig needs to understand how to pitch WITH THE LEAD--minimize the damage--take the control back in every frame. Pitch as if you are behind. Another advantage which Our Washington Nationals let get away again this evening in wet and humid South Florida. Adam Dunn's 20th Homer and eventual three RBI's didn't matter. An early four run lead didn't matter. A Rookie Starter in Stammen that could control most every Florida Batter not named Hanley Ramirez didn't matter. And the rains that eventually stopped this game probably didn't matter as well. We found another way to lose--this time to an All-Star. Our Washington Nationals were again defeated tonight for the 53'rd time in 75 games because they couldn't minimize a great player in Hanley Ramirez. And they let what certainly has become a mental block--The Florida Marlins--get the best of them even when The Fish were down early--and big. Final Score from that ridiculously named Land Shark Stadium where the very day The Marlins move into their retractable roof new ballpark at The Old Orange Bowl Site in Little Havana--MLB will have truly arrived in Miami--The Florida (soon to be, and thankfully, Miami) Marlins 7 and Our Washington Nationals 5 in another rain shortened game. Yes, hate is a harsh word. So for these purposes, The African Queen and I will call The Fish--Irritants. When Sohna called me this afternoon at work to let me know Our Washington Nationals had made a trade, anxiously I waited to hear the details. After she told me Washington traded Lastings Milledge and Joel Hanrahan to The Pittsburgh Pirates for Centerfielder Nyjer Morgan and southpaw reliever Sean Burnett--I had virtually no reaction. Either way, this four player swap didn't excite me. The reasons behind the transaction are clear. Interim GM Mike Rizzo is sending out all those players he feels don't fit in the near or long term future in The Nation's Capital. And when it comes to the present day, the current product displayed on the field needs to be addressed right now--not next year--or with players declared as having so-called potential. Even the very fact that both Milledge and Hanrahan were touted as fixtures in the future of DC Baseball didn't matter anymore. 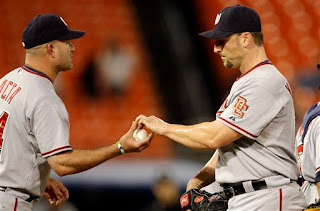 For 2009, both Milledge and Hanrahan were not helping Our Washington Nationals. And whether Lastings would ever become a quality everyday Major League Player in DC--we will never know now. But of all the players involved in this deal today--I actually found myself feeling sorry for Milledge. I don't why. He's far from our favorite player. Maybe it's because he does have talent. Skill neglected by his, at times, wavering attitude and a seeming unwillingness to improve himself. His I do it my way comment a few months back--was really bothering. We've wanted to give Lastings Milledge every chance to succeed. But he wasn't a leadoff hitter. He also wasn't a good centerfielder. And Our Former Number 44 & 85 never grasped any given opportunity here. Only wanting to do it his way, Milledge now finds himself hitting the highway. Frustrating to watch, Lastings failed here, when he really shouldn't have. And no matter what happens in Milledge's future over this swap, I don't want to read any quote from him over the next couple of days that Our Washington Nationals didn't give Lastings a fair chance. If Milledge does state just that, those comments would be more disappointing then his 18 months in a Nats Uniform came to be known. As for Nyjer Morgan, the soon to be 29-Year Old will be inserted into the leadoff spot in the batting order while manning centerfield. Morgan providing speed and agility to track down deep flies. Defensive capability that can only help our young starters on the mound. Burnett, a one time top draft pick for The Bucs--will compose another part in an ever revamping bullpen. When you consider that Mike Rizzo was probably pretty close to designating Joel Hanrahan for assignment--getting a decent lefthanded arm to help at this very moment--was pretty shrewd. But overall--I really don't have much of a reaction to this four-player trade. It's one of those trades where you really have to wait to see the outcome down the line. Each player has their upside, as well as their downsides. Washington is probably a faster team offensively today. A new element at the top of the order has been added. And a better team defensively with Morgan in centerfield. In the bullpen, a more reliable arm for Manny to choose. But more questions now arise. Who is next on the trading block? Nick Johnson? Cristian Guzman? Or, Adam Dunn? Or, all three? Who get's DFA'd when the one roster moves takes place before Wednesday's Game against The Florida Marlins? Ronnie Belliard? Jesus Colome? There are a tremendous amount of personnel decisions to be made over the next month before the July 31st Trading Deadline. Why do I have a feeling this is just the beginning of many moves to come? As stated before, Interim GM doesn't look back--only forward. Today proves just that fact. PS--Sohna's response. "So you are telling me we traded Brian Schneider, Ryan Church, Lastings Milledge & Joel Hanrahan for Nyjer Morgan and Sean Burnett?" Yeah, in a roundabout way. Good thing The African Queen and I are paying attention to Charlie Slowes & Dave Jageler on WFED. Both last night and this evening, they reminded us that this friday night's game at Nationals Park versus The Atlanta Braves begins at 6:35PM--not 7:05PM. Honestly, we would have not noticed the time change on our season tickets. And as far as we can recall--Our Washington Nationals did not make any specific statement about this 6:35PM Start on July 3rd. At least some word that stood out among the usual releases. Odd Time. We would love to know why? Thanks Charlie & Dave!! We owe you two!! "I don't even know what a blog is." Then asking The African Queen: "Is it like Facebook?" Well, it didn't take long for Adam Dunn to realize the importance of 'social media'. Less than two weeks after declaring he's never heard of blogging--Our Number 44 has agreed to pen his own blog on masnsports.com A monthly written venture including a weekly video segment. Fast learner, smooth or just plain coy--Adam efforts will be worthwhile--only if he wants to make a serious attempt to interact. Please Adam--do it well--take it seriously. Fans always have. And so should you. The African Queen will be watching. (Washington D.C.) -- Giving fans unmatched access to the Washington Nationals, MASN announced today that slugger Adam Dunn will host a new blog at MASNsports.com and participate in other interactive features as part of a new partnership with the network. 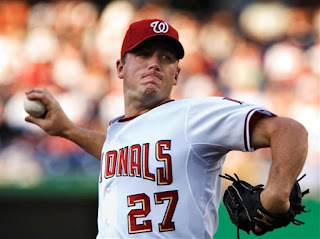 Beginning soon, Dunn will start writing a monthly blog, hosting a weekly video segment, answering fan questions and participating in Wired Wednesdays on MASN for the rest of the 2009 season. Fans will have the opportunity to interact with Adam during his weekly video blog on MASNsports.com, where he will respond to fan-submitted questions directly. Additionally, Dunn will begin writing a monthly blog discussing self-selected topics, and on selected Wednesdays, he will wear a mic during the MASN game broadcast for special "Wired Wednesday" updates straight from the field and dugout. Dunn will also star in commercial spots during Nationals games on MASN. Dunn, a Texas native, is the only big leaguer to record 40 or more home runs each of the last five seasons. "A rare combination of imposing physical stature and offensive output," Dunn signed a two year contract with the Nationals on February 12th. Dunn, who will be honored with his own Nationals bobblehead in August, is eager to learn more about blogging and use the opportunity to interact with fans online. "To talk to fans directly, answer their questions and be able to explain what we do out here every night -- that's a pretty unique opportunity." said Adam Dunn. "I'm obviously new to blogging, but I think it's going to be a lot of fun." 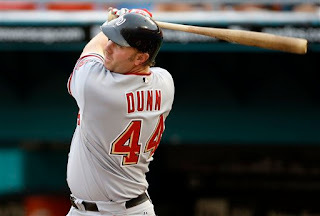 Off to a great start in 2009, Dunn has already launched 19 home runs in a Nationals uniform, including a Eutaw Street bomb at Oriole Park at Camden Yards on Sunday. He's just three shy of his 300th career homer. "MASN is proud to be the home of Adam's new blog, which will surely showcase his energy, enthusiasm, humor and humility. It will be a great platform for fans to get to know more about Adam, both on and off the field" said MASN spokesman Todd Webster. "On television and online, MASN continues to implement new features that bring fans closer to the game and the Nationals." With every available Nationals game, an All-Star talent team, 105 high definition broadcasts and pre and post game shows before and after every game, MASN provides maximum access to the Washington Nationals. MASNSports.com provides extensive online coverage with Phil Wood, Pete McElroy, as well as talent blogs featuring Bob Carpenter, Rob Dibble, Debbi Taylor, Ray Knight, Johnny Holliday, Byron Kerr, and Manny Acta. MASNSports.com also features a fan-centered Nationals Buzz blog, up to the minute video clips in MASN's Media Lounge, series previews, live game blogs and more. MASN is currently carried on 23 cable and satellite providers throughout a seven-state region. 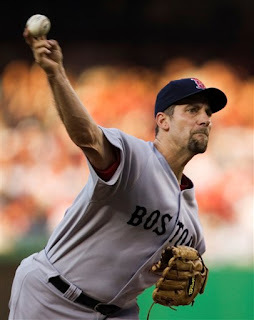 The water/perspiration free flowing over and down Scott Olsen's cap on the mound tonight at recently renamed (AGAIN!!) Land Shark Stadium (and if there was ever a good reason to dislike Naming Rights--this is the ballpark to use as Exhibit A) was funny to watch--almost comical. It reminded me of those cartoons or comic pages where the artist drew drips of water running off a face to best describe a hearty effort taking place. Someone trying as hard as they possibly could to succeed. Our Starting Pitcher this evening in South Florida was drenched thanks to a misting rain and sweat. The water so heavy on the brim of his Blue Curly "W" Cap you could clearly see the various shades of Navy Blue soaking wet near his hat's edge. Rings of water drowning the fabric. Whenever Our Number 19 looked into Wil Nieves for the sign--Scott put his pitching glove directly in front of his face--his customary setup position. And in doing so probably drenched his glove well before Olsen retired from the mound after seven very strong innings. His water logged cap very funny and entertaining to watch--just like the amusing performance Olsen demonstrated on the mound against The Fish. Clearly, after giving up two runs on six hits and walking no one--this southpaw went to Washington's Clubhouse tonight knowing he pitched his finest game of 2009. One in which was his first start in The Big Leagues after six full weeks spent on the disabled list. Scott Olsen dominated at times--at one point retiring 12 in row before allowing a two out single in the 7th. Too bad his counterpart tonight, former Florida Marlins' teammate Ricky Nolasco, was equally as hot while throwing one inning better. A full eight frames, allowing just two runs, on just four hits and also walking no one. Nolasco retiring the final 13 Washington Batters he faced. Together, both pitchers had combined to retire 25 of the final 26 consecutive batters faced. Scott Olsen & Ricky Nolasco were no laughing matters this evening. Too bad the comic relief soon followed. As has happened most all season, Our Manager Manny Acta hands Scott's game over to our struggling bullpen. A tie ball game that was soon no fun to watch at all. Just three batters into the bottom of the 8th, The Florida Marlins scored what turned out to be the game winning run off Ron Villone. Four batters after that not too amusing moment, Julian Tavarez walked in The Marlins' insurance run. Another excellent start by a Washington pitcher wasted. The African Queen and I chuckling over the consistency. As quickly as this game was turned over to Our Bullpen, Our Washington Nationals had been defeated again for the 7th consecutive time this season by The Fish. And Emilio Bonificio was once again a catalyst. Mediocre against most every other team in baseball, Our Former 2nd Baseman Of The Future--plays like a Hall Of Famer against DC. A triple which became the game tying run in the bottom of the 3rd, followed by the game winning sacrifice fly in the bottom of the 8th. Final Score from that stadium where The Miami Dolphins play NFL Football now on it's 6th Name Change--The Florida Marlins 4 and Our Washington Nationals 2 in an affair rained delayed by 37 minutes. Another defeat so similar to the many others that have come before this night in 2009. Strong starting pitching giving way to a weak bullpen. And our offense struggling to score runs with the game on the line. Only Ryan Zimmerman's 13th Home Run Of The Season and Josh Willingham's continued hot bat (two hits, one run scored) doing any real damage this evening in hot & humid, and sometimes raining, South Florida. The very sight of Scott Olsen's Cap Brim streaming water--almost comical. Watching a game from a ballpark named Land Shark Stadium--almost comical. Being beaten by Emilio Bonifacio again--almost comical. Losing for the 52 time in 74 Games--not funny at all. PS--Land Shark Stadium previous titles: Joe Robbie Stadium, Pro Player Park, Pro Player Stadium, Dolphins Stadium, Dolphin (note no "s") Stadium and now Land Shark Stadium (partnership between Miami Dolphins New Owner Stephen Ross with Jimmy Buffett Margaritaville & Land Shark Lager Beer). PPS--Official Attendance Tonight, 10,623. If there were actually 2000 folks on hand, that would be a comical surprise. Interim GM Mike Rizzo seems to have a good idea what he is doing. From the get-go of taking charge of the day-to-day baseball operations of Our Washington Nationals, he's certainly been decisive. Whether or not, Sohna and I agree with everything Mr. Rizzo's done--we've appreciated his boldness. He's continually revamped Our Bullpen under duress by effectively salvaging the junk pile of Free Agency. No, it's not been a perfect solution--but "Riz" (as Team President Stan Kasten likes to call him) has done a solid job of stabilizing some horrific early season relief work. Just look at Mike MacDougal, he may well be a keeper. That work; Rizzo's propensity for hoarding ground ball pitchers; and a 2009 Draft--whether or not you liked all the picks chosen--had not just rhyme but reason behind each of the choices--giving more stability to an ever fluctuating organization. Recall, in a reported pitching heavy draft--it made sense to take as many hurlers as you could. If you get fortunate enough to find a few goodies--you might be able to package some of those, or a few in your current system--to pickup the everyday players well needed later to fill out a successful team down the line. This so-called plan has merit. The thought process solid. Mike Rizzo has admitted he doesn't have a lot of faith in "Toolsy"" players as his first choice. They have their place, he recently stated. Instead, Our Interim GM wants solid talent to maneuver in whatever way he can to improve the product on the field. Take today's two roster moves as a good example of making the most of your parts. As much as some liked to dismiss what Ryan Langerhans could do on the field--he is an excellent defensive outfielder, with solid speed and the ability to get on base (patience at the plate)--although his path back to The Major Leagues was clearly blocked by younger or more veteran players--who NEED to play in The Big Leagues right now. The showcasing part of the game. And with most all odds mostly against Langerhans returning--Mike Rizzo still understood Ryan had value. Today, trading Langerhans to The Seattle Mariners for a utility player with some pop in his bat--Mike Morse. It's a solid move for both teams. Ryan Langerhans will now have a better of chance of returning to The Major Leagues. And Mike Morse will be next in line to be the all-around utility guy every franchise needs in their dugout. Seven years younger than Ronnie Belliard--you have figure that Our Number 10's days as A Washington National might well be numbered (as much as that pains The African Queen). Then, Rizzo's final roster decision this Sunday--after the conclusion of a solid 5-3 Victory over The Baltimore Orioles at Camden Yards--was to NOT lose any one player just yet of that 25-Man Roster. Instead why not bide time, look at other favorable circumstances possibly coming, while giving a young 22-year old the opportunity to win back his confidence in The Minor Leagues. Mike Rizzo understood who was the one with a true future here in The Nation's Capital that needed to be protected. All the while--recalling to the starting rotation--a veteran lefthander acquired this past winter from Florida who supposedly was set to be a staple in the lineup. Raise your hand if you thought Shairon Martis was going to be sent down today to AAA Syracuse when Scott Olsen was removed from The Disabled List? I really didn't think so. The solid money was bet on either Joel Hanrahan or Jesus Colome being Designated For Assignment. When you look at the entirety of the decision, it makes sense right now. Martis has struggled of late. He's hasn't pitched with confidence--too many ahead in the count hits or home runs. We (as fans) have not seen that same Shairon Martis witnessed at Nationals Park on May 3rd against The St. Louis Cardinals. The complete game 6-1 Masterpiece by Shairon. Our Number 39 needs to find himself again. And Our Interim GM understood that. 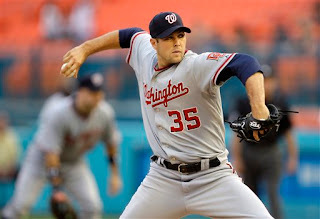 Also, Craig Stammen may be a little more polished--being three years older means a lot more here. This is Craig Stammen's Time to find out whether he can succeed on Baseball's Biggest Stage. Shairon Martis will get another chance. Realize, Martis hasn't lost face. He's exceeded expectations and now has hit a bump in the road. He's only temporarily lost his Major League Starting Rotation Position. In the meantime, Our Number 35 needs to find out whether he belongs for sure. That status--which Scott Olsen will have to work hard to resurrect his once promising career. Olsen may well have his personal confidence back, but Washington needs to find out whether they can trust this southpaw that has struggled to reach 90 MPH on his fastball over the past year. Will his heater return? And if it hasn't, has Our Number 19 the wherewithal to become a pitcher--not just a thrower. This is how you build a team--for the future--making the tough decisions without being forced. Four players and their positions in The Big League Game of Baseball were directly affected today. And in each case, Mike Rizzo gave each and every one of them another chance to succeed in The Major Leagues--even if that meant Ryan Langerhans now plays for The Seattle Mariners. Under Our Interim GM's reign--forward movement is being accomplish. The proper judgement of the talent currently on hand is taking place. What's needed for the short-term and long-term success of Our Washington Nationals is being discussed. Joel Hanrahan and Jesus Colome may well feel like they received a reprieve from Mike Rizzo today--both are still on the active roster. But what Mr. Rizzo really did this afternoon was serve notice. No one is lucky to be on a Major League 25-Man Roster. And once someone better comes along or becomes available--you will be replaced. No one is safe--even if you have survived for another day in The Big Leagues. Clearly, no one is going to force Mike Rizzo's hand. When the time comes and any move can be properly and reasonably made--then and only then--will Our Washington Nationals make a final decision. Clutter hasn't affected Our Interim GM's thoughts. Ill-fitting parts have not forced rushed judgement. A losing record has not brought on panic. Although not yet given The Permanent Title, Mike Rizzo has steadied Our Washington Nationals and brought professional opinion to every single one of his moves. He's raised the awareness that not all judgements involving DC Baseball are performed at random. There really is a plan with this guy. And in doing so, Mr. Rizzo has raised the spirit of The African Queen and I. Being 30 games below .500 has taken its toll on us, but knowing "Riz" has brought a sound philosophy to his work--has given us even more confidence that Our Washington Nationals are really moving in the right direction--even if he scares Sohna at some times. You may recall, he told Sohna: "I scare myself sometimes too!" Now, let's just remove that "Interim" title while we are at it. PS--Although having Club Level Tickets today at Camden Yards, Sohna and I couldn't make the final game of the three game set in Baltimore between Our Washington Nationals and The Orioles--personal business took priority beginning late last night. But, we would have loved to see Adam Dunn's Blast that bounced on Eutaw Street and then off a 2nd floor window of The B & O Warehouse. And we would have enjoyed seeing John Lannan continue to make himself a solid Major League Starter. Lannan's quickly becoming the stopper of losing streaks in the rotation. Curly "W" Number 22 was a well played game by DC's Team. We believe Our Franchise has some parts--just not enough of them yet. 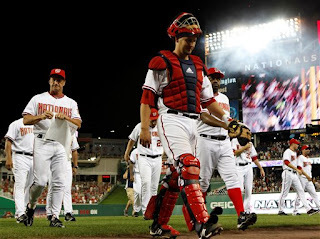 But with Mike Rizzo calling the shots--we are more confident than ever that Our Washington Nationals are turning the corner back to respectability. PPS--Finally, Sohna and I wish Shari & Ryan Langerhans well. We've never been ashamed of cheering for good people like them to be successful. Like The Schneider's, The Church's and Chad Cordero before them, The Langerhans' always appreciated our efforts, and fandom, here at Nats320. They respected our hard work and were always available to chat with us if we happened to come across them at the park or team events. It's still the hardest part of being a fan of any Major League Team when the business side always takes priority. We've come to understand--the personal side is always fleeting. But we are happy and pleased that we came to know Shari & Ryan Langerhans, ever so slightly, during their time here in Washington, DC. We wished we knew them better, but they considered us friends. And we will forever be content with that. Some of what Team President Stan Kasten spoke about at length this past Thursday at The National Press Club Luncheon--mirrored exactly what Mr. Kasten said during The Blogger Day Get Together at Nationals Park. But there were some other fresh answers beyond the original three comments posted a few days ago. It took The Mets seven years from inception to win The World Series, how far along are you in the same process? Are you really following the path of The Atlanta Braves of the ‘90’s? As President of The Washington Nationals—how much blame do you take for the poor performances? Is there a limit to how much you can invest in one player (Stephen Strasburg), one that has never played one inning of a professional game? On Tom Boswell’s story that Ownership is more concerned about making money than winning? Finishing up and concluding Wil Nieves' Meet & Greet appearance at The ESPN Zone in downtown Washington, DC on Wednesday, June 24th--Radio Broadcaster Charlie Slowes is fielding questions from a very attentive audience of fans of Our Washington Nationals. Question: How do you keep up the energy to play everyday when the team isn’t doing so well? Question: How hard is it to focus on the batter with runners on base attempting to steal? Question: How has technology changed how well you prepare for not just the hitters, but as a catcher and scouting opponents? Question: When do you believe The Nationals might be ready to challenge The Phillies, The Mets and teams like that? Question: Your manager Manny Acta really seems to follow your philosophy about positive thinking and looking at things positively. Myself and many other Nationals Fans admire him a lot for the way he conducts himself and the way he emphasizes the positive. How is he doing? We see the public side. Is he sort of a little down? As he taken all these criticisms and speculations in the newspaper about his last days---does he take it to heart or does he concentrate on doing his job and continues to motivate the team? Question: Does your hard hurt when Joel Hanrahan pitches? Question: Is it better to be taller or shorter as a catcher? 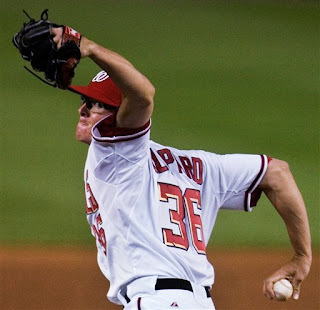 Question: How excited are you about this year’s draft class with Stephen Strasburg and Drew Storen? Question: It is often described that catching is an art. Is there any one catcher in The Major Leagues that you particularly enjoy watching? With that final answer, The ESPN Zone Q & A Session with Wil Nieves concluded. Fans then lined up to receive autographs from Our Number 23 and take pictures. The next ESPN Zone Lunch Time Get Together is scheduled for Tuesday, July 21st--player to be announced. Even Ryan Zimmerman probably appreciated the effort. There wasn't much else to cheer about this evening. The latest re-incarnation of "Roy Hobbs" slammed out the longest hit baseball I have ever witnessed at Camden Yards. Too bad it was foul. The Baltimore Orioles Matt Wieters unloaded on a Joel Hanrahan 94 MPH Fastball that went so deep off his powerful bat, the screaming baseball was out of Orioles Park in a split second. Over the packed crowd, past the right field pavilion, onto Eutaw Street while scattering fans. And maybe, just maybe--bouncing off the bottom of The B & O Warehouse. But from The African Queen's and my vantage point on the first base side at the pitcher's mound--we lost sight on the baseball's downward flight streaking past the stands. 45,024 were in absolute awe over the display. But when First Base Umpire Doug Eddings signaled FOUL!! by raising both his arms, then ruling the ball went to the right of the yellow foul pole--Not A Home Run, Just Another Strike--it was the only time all evening when I would have accepted The Orioles Scoring ANY RUN. Couldn't stand the other eleven scores plated by Baltimore against Washington tonight. But this game was SO OUT OF HAND, I could appreciate Matt Wieters' accomplishing a feat I have personally never seen in Baltimore. "The Natural" showed all his potential on that one swing of the bat. What a pretty swing from a 23-Year Old Rookie!! Too bad Our Washington Nationals effort tonight was not so beautiful. This game got so bad in the bottom of the 6th inning that I turned to Sohna and mentioned--If Melvin Mora hits a home run right here (for Baltimore), it will be the first time that I can remember being at a game when ANY TEAM has scored more than 10 runs in one inning? Do we really want to see that too? Thankfully, that awful scenario didn't happen. Baltimore scored just eight. But a whole lot of bad baseball was on display this evening--especially in the pitching and fielding department. 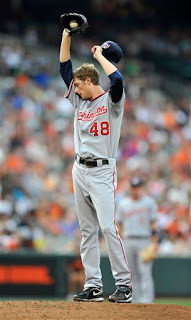 Ross Detwiler was really shaky, struggling all night. And we were really surprised when Our Manager Manny Acta sent Our Number 48 back out to the mound down 3-1 for bottom of the 6th. Ross didn't look sharp. And when he gave up two quick hits to the first two batters he faced--the floodgates opened--thanks to Joel Hanrahan and Ron Villone pitching their worst baseball of the year. And defended by Cristian Guzman making a silly error extending this awful frame. There is really not much to say about this game--other than the fact that Camden Yards still looks as nice as the very first day it opened on April 6th, 1992. Sohna and I spent the final three innings of this lopsided affair chatting with these three ladies sitting directly behind us. They had never been to Nationals Park. And we have convinced them to check it out personally over the July 4th Weekend when The Atlanta Braves visit The Nation's Capital. Score One For Us For Ticket Sales. Final Score from Orioles Park where despite a near sellout crowd there were not many folks sporting The Curly "W"--The Baltimore Orioles 11 and Our Washington Nationals 1. Loss Number 50 in 71 Games was basically a blowout and a No Show effort on the part of Our DC Fans. A Scattering of Red & Blue throughout Camden Yards--but nothing like a few years ago when seemingly 10,000 Washington Fans traveled up The Parkway to see DC's Team. One group of college age Nats Fans running into us after the game stating that between us and them: "We were about the only six folks here tonight rooting for Washington." There were more than not--but certainly not many. No DC Fan probably missed anything anyway. There really wasn't much to cheer about for fans of Our Washington Nationals. Except for that potential Gigantic Homer off the bat of Young Matt Wieters--that was really pretty. By the way--WE LOVED The Orioles Friday Night Fireworks. A terrific performance. Lasting more than 10 minutes, choreographed with music and being set off right in front of everyone from just over the Centerfield Wall at Camden Yards--the backdrop of The B & O Warehouse and Baltimore Skyline is accentuated by the display. And being able to actually watch the streamers fire off and soar into the air--makes it all the more special. We understand that at Nationals Park the fireworks are set off near The Anacostia River outside the stadium. And there is probably nothing that can be done to change that. But watching the pyrotecnics take off, not just explode in the sky above--really makes a difference. We really enjoyed The Fireworks Show at Oriole Park. As every Nationals Fan probably knows, you can purchase your Curly "W" Pretzel at Noah's Pretzels at Nationals Park. A staple that has become well received on South Capitol Street. Well, you can also now purchase a Noah's "O" Pretzel at Camden Yards. Noah's Pretzels' Owner, Dwayne Herndon, took over exclusive Pretzel Sales at Baltimore's Baseball Park this season. And Sohna and I went to visit them tonight. It's funny seeing virtually the exact same employees, like Seth (shown above wearing the orange & black) selling pretzels for fans of Our Washington Nationals, and doing the same for fans of The Baltimore Orioles. Sales so good for Dwayne's personal efforts to promote education and funding for those with Autism--during the bottom of the 6th inning at Camden Yards--The Fan Of The Game in Baltimore is brought to you by Noah's Pretzels. We all chatted for some time, before and after tonight's game. Finally, before the game, Sohna receiving the love from three Navy Midshipman Football Hunks promoting their upcoming fall season at Marine Corp Stadium in Annapolis. They were pretty cool and into the spirit of it all. PS--Sohna and I have never experienced worse traffic getting to any game in Baltimore--like ever. We left our house at 2:45PM--hoping to eat an early dinner at a certain sushi bar we enjoy in The Inner Harbor. 2 Hours and 45 Minutes later we finally made it to the parking lot two blocks from Camden Yards (5:30PM for a usual 65 minute drive). Friday afternoon traffic is usually bad, but never this horrible. From 295 in The District to The Baltimore-Washington Parkway, all the way to The Baltimore Beltway (I-695), nothing was moving. I-95 north wasn't any better. We crawled along at 10 miles per hour most of the way--if that--hundreds of complete stops. Like I told Sohna while sitting in traffic--it makes you appreciate just having to go to Nationals Park most of the time anymore--not having to worry about getting to and from a city 40 miles away--especially on a work day--to enjoy Major League Baseball. Of course going home after the game--we cruised in the normal 65 minutes. No problems whatsover. His infectious smile always draws attention to him. And whether or not Wil Nieves was a Major League Baseball player for Our Washington Nationals--he would be the same outgoing and friendly fellow. This past Wednesday afternoon, June 23rd, before the second game of the three game set between Washington and The Boston Red Sox at Nationals Park, Nieves joined Radio Broadcaster Charlie Slowes at The ESPN Zone in downtown Washington, DC as the guest of honor for the monthly in-season lunch time Meet & Greet. For nearly 50 minutes--Wil and Charlie entertained a rather large gathering--telling stories, sharing information and showing some fine humor. The transcript is so long--I am breaking it into two parts. Wil Nieves is quite the interesting fellow. And his Mom has been a big influence in his life. With that--here we go with Part One of Wil Nieves at The ESPN Zone. Question: What is you favorite thing to do when you are not playing baseball? Question: Can you talk a little bit about the game plan that you do with pitchers—like how much input you have? What the pitching coach says? And how does that relate to the new pitching coach (Steve McCatty)? Wil: “First game of every series, we sit down with all the pitchers and the catchers and the pitching coach and we talk about the guy going against us. We got stats. We have videos—a bunch of stuff that helps us make the pitching plan. We usually combine that pitching plan with what (our) pitcher has. Sometimes, you might have a guy that can’t hit a breaking ball, a curveball. But our pitcher doesn’t have one. It’s hard. When we are playing good teams, we just try to follow the plan. And if it doesn’t work, we try to change it later on. But we just try to combine what our pitcher, their stuff, with the plan (of the opposing batter). We combine those things and hopefully we call a good game off of that. Question: What’s your impression of seeing all the starting pitchers being so young this year? And then with the relief pitchers—why are we having so much trouble with the experienced relievers? What the problem there? Question: What is a typical game day for you—getting to the ballpark, pitchers meetings, etc.? Question: Wil, when you hit your walk off (home run) against The Cubs, what was going through you head? Question: What made you want to play catcher? Question: What was your favorite team as a kid? With that answer--Part One of Wil Nieves at The ESPN Zone in Washington, DC comes to an end. Part Two coming later. Those Boston Red Sox Fans on hand, once again, for the largest crowd to attend any game at Nationals Park's short history for the third consecutive night--were finally up and cheering. For over five innings on South Capitol Street tonight, Jordan Zimmermann had SHUTDOWN one of the best hitting teams in baseball. In fact, a serious World Series Contender. But now--Red Sox Nation sensed a comeback--maybe--even the kill. Our Washington Nationals were up Five-Zip, but that margin didn't seem near enough runs. With only one recorded out so far in this game deciding 6th frame, Boston had placed runners on 1st and 3rd. J.D Drew had softly slapped a broken bat single to left. And Jason Bay had followed with a first pitch single to the exact same spot. Just the kind of situation in which Our Washington Nationals tend to let things get out of hand--make things worse--do something that causes pain. Of course, with Big Papi stepping to the plate, who among that largest crowd of 41,985 didn't believe The Red Sox were going to inflict some serious damage? Last night, David Ortiz slugged out a three run game breaking homer off Washington Rookie Craig Stammen. A full-count situation in which Our Number 35 didn't trust his instincts--which was to throw his fastball. For over the first five innings, this third game of the most anticipated series of 2009 in The Nation's Capital had been all Washington. John Smoltz was making his very first start EVER for The BoSox--facing a DC Team in which he had mixed results while spending his entire career with The Atlanta Braves. Recovering from shoulder surgery, this sure-fire Hall Of Famer, has only recently recovered. And during the very first inning he's pitched all season on The Big League Level this year--Our Washington Nationals jumped all over him. Four runs scored before Smoltz retired his counterpart Zimmermann to end the largest 1st inning at home since that April 18th five run rally against The Marlins. A big advantage that was pushed to five in the 3rd on a Josh Willingham double following by a Josh Bard Single--again off Smoltz (Both Willingham and Bard major players in tonight's game--but more on them later). An early lead for The Home Side that Our Number 27 protected by hammering the strike zone. No one from Boston's Potent Lineup was standing in his way. Jordan Zimmermann was earning respect. Not even a terrible decision by Anderson Hernandez and Cristian Guzman to NOT call for a routine infield popup that dropped for a single off the bat of Jacoby Ellsbury--kept JZ down. He was on top of his game. But now--as the top of the 6th unfolded--Zimmermann needed to settle down. Beloved in Boston--probably forever--David Ortiz may be on the downside of his illustrious career--but he's still a dangerous slugger. One that's not going to miss a rookie mistake. Stammen didn't trust his fastball on Wednesday Night and instead threw his weaker pitch--the change up. Big Papi deposited that pitch over the centerfield wall for a 3-1 Boston Advantage. A shot that sent Red Sox Nation into a tizzy at Nationals Park. Tonight, Jordan found himself in a similar situation. Pitching well, with the lead, and the opportunity for failure knocking on fortune's doorstep. If Boston's Fabled Number 34 takes him out of the park--The Red Sox are back into this game down by just two. New Ball Game--a completely different outcome in the works. But from the very first day Jordan Zimmermann stepped on the Major League Mound at Nationals Park back on April 20th--he hasn't been afraid. Even challenging Albert Pujols on May 1st on South Capitol Street when he simply didn't want to give up a walk to The St. Louis Cardinals Slugger. Instead, JZ gave up a titanic home run to the best slugger in the game. A learning experience taken to heart--now to be used against David Ortiz. As The BoSox Faithful roared with delight--anticipating the big drive--Our Number 27 just kept pounding the strike zone. What Jordan came to understand was that the soon to be 34-Year Old Dominican Slugger couldn't get his bat around on J-Zimm's 94 Mile Per Hour Heater. Don't give Ortiz something off-speed. Don't give David the chance to play Goliath. And on the 4th pitch of this pivotal At-Bat, Jordan Zimmermann WON THIS GAME--by allowing a sacrifice fly. Yes--by letting a run to score. Big Papi weakly flying to Josh Willingham in left field--just deep enough to score Boston's first run of the evening while quieting The Red Sox Fans and settling down a nervous Washington Fan Base anticipating the worse. And when Mike Lowell followed with a wicked liner just above Ryan Zimmerman's head that Our Number 11 snared for the inning ending out by seemingly climbing that extra few inches needed to catch the baseball--after already leaving the ground (really it was amazing how Our Number 11 was able to STRETCH HIMSELF at a split seconds notice)--that other "Z"--the real star of the evening--Jordan Zimmerman--had over come a top hitting lineup. He had quieted two fearsome batters. He had shut up Red Sox Nation. And turned some heads and earned respect from those sitting in the Boston Red Sox Dugout. A nod of appreciation for a job well done. The Signature Moment for a rookie looking for validation on The Big Stage. Jordan Zimmmermann would complete 7 strong innings this night at Nationals Park. He dominated at times, and didn't give in to anybody. The Heart Of A Lion this young man possesses. And when JZ slowly walked off the mound to the home dugout at end of his valiant seven innings, Our Fans gave their hearts over to him. A Rousing Standing Ovation in appreciation of a job well done. A respect earning outing that even had Red Sox Nation--educated baseball fans as they are--respectfully joining into the appreciation. Final Score from Nationals Park where Our Fans were treated to a coming out party by Jordan Zimmermann--Our Washington Nationals 9 and The Boston Red Sox 3. Certainly, Our Offense gave Our Number 27 his lead. Our Defense protected it. But JZ was the story tonight. And The Bang!! Zoom!! Of The Fireworks!! signaled that a young pitcher from a small school in Wisconsin (Stevens Point)--can compete against the finest in the game. And Curly "W" Number 21 solidified the very fact that Our Washington Nationals have some good, young and very talented Starting Pitching. Remember, no matter the score, there is a moment in every game in which everything hangs in the balance. And tonight's signature rested on the bat of David Ortiz in the top of the 6th. Unafraid, his greatest attribute, Jordan Zimmermann went right after Big Papi to retire him. The Defining Moment In This Game. Jordan Zimmermann would leave after seven complete allowing just one run. He struck out six, walked JUST ONE, and allowed seven hits. Over his last four starts he's posted a 1.90 ERA in 23.2 innings pitched--striking out 22 batters. He really is so impressive to watch on the mound and tonight earned his 3rd career Major League Victory. Tyler Clippard was less so. Making his first Major League appearance of 2009, Our New Number 36 looked rather shaky. Given work in a blow out--Tyler allowed a double to Mark Kotsay in the 8th and a two run homer to Rocco Baldelli in the 9th. Apparently, The Boston Red Sox ran out of position players and were forced to bat Pitcher Ramon Ramirez with two outs in the final frame. A big advantage that Clippard used to strike out the Boston Pitcher on a high fastball to end this game. But Tyler wasn't strong--in his first on the job training for Washington. Although to his credit, Clippard wins serious points from us for The Cool Shades Worn and The Very Awkward (almost ostrich like) Pitching Delivery. Washington had early game batting practice against John Smoltz. 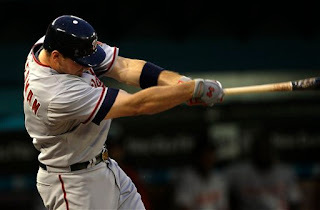 After Smoltz hit Nick Johnson with one out in the 1st inning (a pitch that eventually forced NJ from the game with what's been called a "shin contusion"), Ryan Zimmerman followed with a drilled double down the leftfield line. Adam Dunn walked to load the bases. Josh Willingham singled to left scoring Johnson. Josh Bard then followed with another single to right scoring Zimmerman. And after Willie Harris lined out to J.D. Drew in right--Anderson Hernandez came up clutch with a two strike bleeder to left field scoring both Dunn and Willingham to give Washington a 4 run early lead. An inning that found John Smoltz's ERA balloon to 54.00 at the completion. Josh Bard and Josh Willingham big contributors at the plate this evening. Bard--three hits, two rbi and one run scored. Willingham with two hits, one rbi and two runs scored. 11 total hits off Red Sox Pitching tonight for Washington. That sparkplug--also known as Willie Harris--powered out a two run homer off Takashi Saito on the very night he matched his season high of three hits in one game. A game distancing home run into the second deck in right that put Washington up 9-1 in the bottom of the 7th. Ryan Zimmerman made a series of fine plays at third base this evening. That nice catch on a rising liner off the bat of Mike Lowell in the The Signature Moment 6th inning. The fielding of a high chopper over the bag hit in the 3rd by Jason Bay that Our Number 11 stopped, then quickly turned and jump tossed to Anderson Hernandez at second base to retire J.D. Drew. But his best effort came in the top of the 2nd when Lowell SMASHED a grounder to Ryan's left. The Z-Man dove and when the baseball took a last second hop up and above his sprawling body--he swiftly reacted and caught the baseball. Then got to his feet and threw across his body to retire The Red Sox 3rd Baseman easily at first base for The Defensive Play Of This Game. This was first time since Our Washington Nationals came into existence--they have beaten The Boston Red Sox in six games played. Boston took all three games at Fenway Park in 2006 and two of the three played this week at Nationals Park. A relay race was on the agenda for Our Racing Presidents Tonight in the middle of the 4th inning. Abe & George took off on Segways from the left field foul line. Then, Teddy and Tom raced from The Centerfield Gate to right field. Whereupon each needed to hop into a Pedi-Cab and head back to centerfield. While Tom let the Pedi-Cab Driver take him for a ride. Teddy took his driver for a ride. And of course--lost at the last second. Teddy just can't win despite himself. Despite the latest largest crowd ever of 41,985, tonight's attendance was composed of a significant amount of Washington Faithful. An early lead kept Red Sox Nation quiet, but even when the "Let's Go Red Sox!!" chant began to brew along the first base line at Nationals Park--Washington's fans were able to drown them out with "Let's Go Nats!!" But we got to say, Boston's Fans were really well behaved. They came to cheer on their team, and from what we witnessed, were not jerks making an effort to dismiss and make fun of Washington's Faithful. One of these days when Our Washington Nationals are really good and they are the main draw--that will be a great moment. But for this three game set, The African Queen and I appreciated the energy and excitement Boston's Fan brought to Nationals Park. Our New Ballpark looks TERRIFIC when packed. We can't wait to see that on a more consistent basis. Of course Sohna was joining into those "Let Go Nats!! chants while still displaying her NatsTown Towel on the glass railing in front of our seats in the front row of Section 218. And finally--there was this guy sitting in The PNC Diamond Club apparently having his Bachelor's Party. Wearing a Red Boston Jersey--he had pinned to his back the following sign: "Getting Hitched On Saturday!!" We laughed and laughed and laughed. He appeared to be having a good time--whether his Boston Red Sox won or not.